are two international publishing executives with a wealth of experience who have been friends for more than 20 years. Though fluent in Japanese, Richard has always wanted to read the very best Japanese creative writing in English; and for years it’s been Koji’s ambition to make the best Japanese contemporary writing accessible to readers outside Japan. 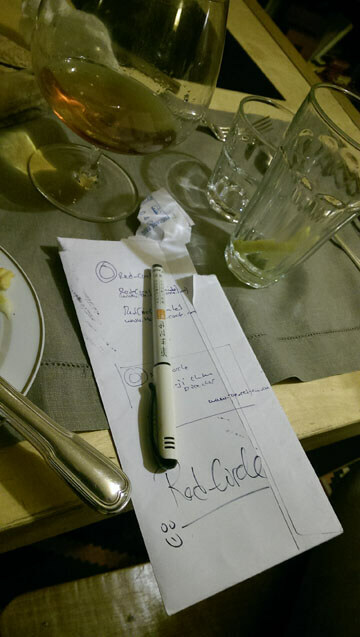 Notes made at brainstorming dinner in London when the name, logo, and company branding were agreed. So together they have set up Red Circle with the aim of bringing the works of some of Japan’s finest authors to a wider international public, while at the same time building their international reputations. In doing so, Richard and Koji are convinced that readers, no matter where they live, will be captivated and thrilled by the sheer brilliance and inventiveness of Red Circle authors. The company’s select circle of authors are already established and well known in Japan. Indeed, many have won Japan’s main literary prizes, had their works adapted for film and television, and have had numerous titles included in the lists of bestsellers in Japan. In November 2018 Red Circle launched its publishing programme with its series Red Circle Minis. Each of the books is a first edition written specifically for the series and is being published in English first. Red Circle is now working very closely with its authors to build their careers, profiles and readership globally. With this in mind, Red Circle is creating a network of international partnerships. These currently include collaborations with TranNet, Tokyo’s leading book translation company that has translated hundreds of titles from leading international and local publishers into Japanese, English and other languages; and Japanese Writers’ House, a highly regarded Tokyo-based literary agency. Koji Chikatani writing his circle to be combined with Richard’s for the company logo. Red Circle’s logo, which consists of two fused circles, drawn using a traditional Japanese calligraphy brush and ink, by each of the Company’s founders, reflects its approach and strategy of bringing together companies, organisations and individuals with a love of and fascination with contemporary Japanese creative writing. Red Circle is also working on new projects and more books with its curated circle of authors. If you would like to be kept informed about Red Circle and its projects please register here. Registered address: Third Floor, 24 Chiswell Street, London EC1Y 4YX.